As 2018 comes to an end, I always reminisce on the memories I had- the good, the bad, and the funny. I also take a journey down outfit memory lane and look at how my style has evolved this year. Color became more important than ever before and maximalist me took over. The answer to “should I add this piece to my look?” was yes! It is really interesting to look back at this year and see how my life events influenced my looks. Fashion was a major part in helping me get my ‘mojo’ back- could you tell? So take a look back at your outfits this year and see if your style has evolved. This New Years Eve, I’m not gonna be in a fancy dress (probably will be wearing tons of layers to keep warm in Iceland) but I wanted to share a look with you that I think would be perfect for a festive night out. Bring out the lace, feathers, furs, and bling baby! It’s time to celebrate all the hard work you’ve done this year! Pink and polka dots are two of my favorite things combined! Polka dots are one of this seasons biggest print trends! It's a classic print that looks great with everything! It especially for a work outfit. 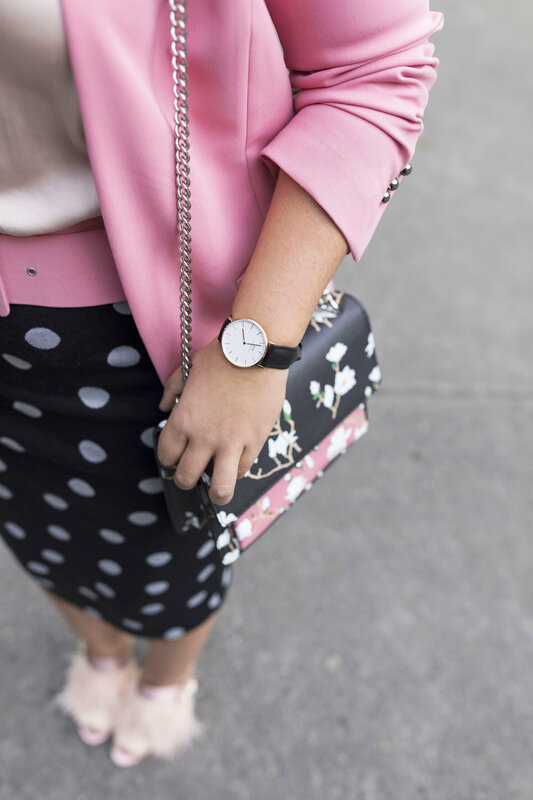 A polka dotted pencil skirt is a fun way to revamp your work look to stay fashionable. It's an easy print to mix with solids as it pairs well with any color. A pink blazer in my opinion is a must! But if you're not into pink, try another color- red, yellow, or blue. A bold colored blazer is a good way to add color in your wardrobe. An easy way to wear a colored blazer is by wearing it with black staple pieces- a little black dress, black blouse, pants pants, etc. Try mixing in black based print like a polka dot to give it a spring feel. A polka dotted blouse is a great option to wear under the blazer for a work look. I love trying new things through my accessories! I love to make an outfit fun and give it an unexpected touch with my shoes and bags. The feather and crystal details in the shoes add texture appeal the look. Adding another print, like a floral, brings even more interest to the full look. Do you have a sequin skirt or dress you bought for a party that your dying to wear again? I have the same problem because I love sparkly clothes. How do you make a sequin fashion piece workable for the day time? It's super simple, pair it with a casual sweater! The sweater instantly makes a sequin skirt feel easy going. I prefer a chunky oversized knit sweater because it looks casual and feels a little warmer. The great thing about an oversized sweater is you can even wear a dress underneath and fake it like you're wearing a skirt. A way to completely transforms look are through shoes. For a sequin and sweater combination, there are many shoe options. To keep your legs warm, put on a pair of tights and boots. You could even pair this look with over the knee boots. If you're in the mood to wear fancy shoes (like I was), try layering a thick sock or even fishnets. See how I wore that trend here and here. If you're looking for an even more casual look, another show option are sneakers. This look is easy to pull off and super comfortable. I love my Alix and B 14k gold choker! It is simple, trendy, and is a perfect finishing touch for any look. I love the mixture of the different chains and the sizes. It makes a choker so much more interesting compared to others! You no longer need to feel guilty about making that New Years Eve purchase thinking you'll only wear it once. Fashion has always been something I've been passionate about ever since I was a little girl. I think one of the biggest reasons why is because I love being able to express myself through my clothing. It's a way to really show who you are without speaking- which I think is amazing! This denim patchwork jacket does just that! I'm a huge thrift store shopper. A few years ago, I found this amazing Levi's denim jacket for only $6!! I had to buy it! So for fashion week, I decided to customize it and really make it my own! After finding a few patches that represent what I love (lipstick, vacationing where there are palm trees, and fun sayings. I put them on my jacket. My plan is to fill the entire jacket up with patches over the years- from every country/ city I visit. Quick tip: don't super glue! I learned the hard way. I was trying to take the easy way out. Sometimes the best way to wear a cocktail dress is by pairing it with something casual, like a denim jacket to change things up. It makes the dress more interesting by creating the juxtaposition of classy and casual. You can take off the jacket and the look becomes formal. I wore a ton of my funky bright bracelets to bring out the colors of the jacket. Paired it with red pumps and matching bad to finish the look.